With the Lamb of God. Then one of the elders addressed me, saying, ‘Who are these, clothed in white robes, and from where have they come?’ I said to him, ‘Sir, you know.’ And he said to me, ‘These are the ones coming out of the great tribulation. They have washed their robes and made them white in the blood of the Lamb. Once, after hearing Edward Elgar’s ‘Pomp and Circumstance’ march, William Kuipers decided to write a new hymn text that could be sung to it. At the time the march was associated with the patriotic hymn ‘Land of Hope and Glory.’ Kuipers wrote this text late in 1932 while he was pastor of the Summer Street Christian Reformed Church (CRC), Passaic, New Jersey. He submitted it to Henry J. Kuiper, editor of the Christian Reformed Church weekly, The Banner, and a member of the committee preparing the 1934 Psalter Hymnal, which was the first denominational collection including hymns (the CRC had previously sung only psalms in worship). Because Elgar’s music was under copyright, The Banner held a contest to find a new tune for Kuipers’s text. The magazine received 150 tune entries and recognized first, second, and third places, as well as six honorable mentions. First prize of $10 was awarded to Siebolt H. Frieswyk of Whitinsville, Massachusetts, and his tune was published with Kuipers’s text in The Banner, May 5, 1933. However, an honorable-mention winner by John Vanderhoven was chosen as the setting for this text when the new Psalter Hymnal was printed in 1934. That association of text and tune has been continued in each of the following editions of the Psalter Hymnal. Because it was used as a theme song for The Back to God Hour broadcasts, this hymn became well known to a whole generation of radio listeners in the 1950s and 60s. And thus, this beloved hymn is in some sense “our own” here in the Dutch Reformed tradition. As I researched this history, I was thrilled to find a digitized version of a single video episode of the CRC’s “Back to God Hour” from 1953, with Rev. Peter Eldersveld. In the opening of the film you can hear the Calvin Radio Choir singing the third stanza of “By the Sea of Crystal.” The format of the video prevents me from embedding it on the blog, but you can click here to access it. However, today’s Featured Recording is not from sixty years ago, but from six weeks ago. “By the Sea of Crystal” is still a beloved hymn nearly everywhere in the United Reformed Churches in North America, and this recording is particularly rousing. Here is Grace Reformed Church of Dunnville, Ontario, singing it with all their hearts. To me, eschatology (the study of the end times) is probably one of the most confusing doctrinal battlegrounds in all of the Christian faith. Theologians have presented a dazzling array of perspectives and opinions from every angle imaginable. For instance, did you know that Israel’s modern status as a leading agricultural producer fulfills the end-time prophecy of Isaiah 27:6? Or that President Obama’s visit to Israel this March, which supposedly corresponded to the day Christ made his entry into Jerusalem, fulfilled Daniel 9:27 and ushered in the Final Seven Years of World History? Neither did I. Compared to the complicated hypotheses of dispensationalism and equally popular evangelical views, the Reformed doctrine of the end times is refreshingly simple. As we prepare to celebrate Ascension Day tomorrow, we continue our series on the Heidelberg Catechism by considering the comforting words of Lord’s Day 19. 50 Q. Why the next words: ‘And sitteth at the right hand of God’? and that the Father rules all things through him. 52 Q. How does Christ’s return ‘to judge the living and the dead’ comfort you? and so has removed the whole curse from me. into the joy and the glory of heaven. In Sing a New Song: Recovering Psalm-Singing for the Twenty-First Century, Anthony Selvaggio refers us to an article by the Reformed theologian Geerhardus Vos entitled “Eschatology of the Psalter.” In that work, Vos explains that the Psalter tempers the church’s perspective on eschatology and focuses it on the redemptive work of Jesus Christ. (For more on this fascinating essay, you may be interested in a URC Psalmody discussion on chapter 9 of Sing a New Song Jim Oord and I wrote last fall.) Indeed, the psalms have much to say about the confident hope believers can possess for this life and the life in the world to come. Supreme o’er all be Thou adored. Shall Thine anger burn, O Lord? 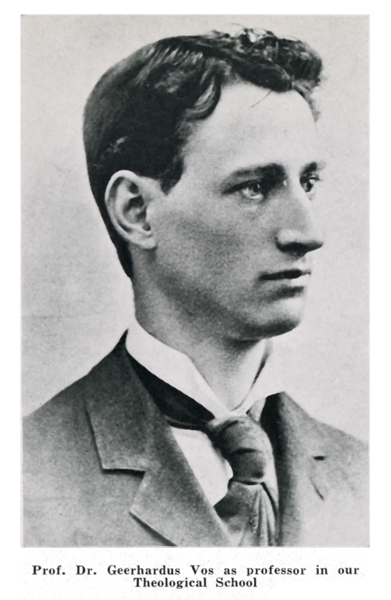 Geerhardus Vos (1862-1949) is a well-revered name in Reformed biblical theology. His greatest contribution was the redemptive-historical concept of studying the Scriptures, tracing the growth, development, and unity of the plan of salvation throughout history. His teaching thus does much to show how the entire Bible is not a disparate collection of stories, but one unified tale of the salvation of God’s people, centered on Christ. In Chapter 9 of Sing a New Song, entitled “Psalm Singing and Redemptive-Historical Hermeneutics,” Anthony Selvaggio looks at one of Vos’s lesser-known articles, “Eschatology of the Psalter.” We’ll be evaluating Selvaggio’s chapter as part of our ongoing series on Sing a New Song. At the very beginning, Selvaggio acknowledges that psalm-singing and the redemptive-historical approach might seem to be mutually exclusive. Not so! he claims. In simpler terms, Selvaggio’s point is to show that psalm-singing wasn’t just for the Old Testament people of Israel—it’s equally applicable for the Christian church today. After summarizing and unpacking Vos’s essay, Selvaggio argues that the singing of psalms is a remarkably redemptive-historic and Christ-centered enterprise. As we begin discussing this chapter, Selvaggio’s theological language may seem a bit daunting. But it’s important to realize that tough words like “eschatology” and “soteriology” have quite simple definitions. Eschatology is the study of the last things (the second coming of Christ, the end of the world, &c.), covering not just Revelation but the teachings of the entire Bible. Soteriology is the study of salvation, from justification to sanctification to glorification, and so forth. MRK: Vos’s article referenced by Selvaggio begins with a comment about the practice of printing New Testaments with the book of Psalms at the end. Vos’s point isn’t to comment on the ordering of the canon of scripture; he merely wishes to point out “that the book of Revelation and the Psalms have much more in common than we might at first think,” as Selvaggio says (p. 150). Vos was concerned about the low view of the psalms as mere devotional material prevalent in his day; his thoughts still ring true these many decades years later. In powerful language, he writes that he desires to “shake us out of this habit and force us to take a look at the Psalter’s second face.” Hence his thesis, as summarized by Selvaggio: “that the theology of the Psalter is predominantly eschatological [pertaining to the end times] in nature.” This focus shapes the rest of Vos’s article on psalmody, which is divided into six main points. JDO: Vos’s first point concerns what Selvaggio calls the “Subjective/Objective Dynamic.” The Psalms are a heartfelt, personal way for God’s people to react to the facts of his work in history. And just as God’s purpose is expanded and clarified as time goes by, the psalms themselves develop and become more specific and pointed. The common thread in all the psalms is a looking forward to the future coming of Christ. MRK: Vos also points to the “dynamic/static” pattern within the psalms. God’s mighty acts of redemption, condemnation, and consummation are “intrusive, violent, and disruptive” events in history, while the eternal state of the Christian is peaceful rest in God’s presence. Both concepts are thoroughly present in the Psalter, because the dynamic break-ins of God allow for the static peace of his people. JDO: The Psalms also serve as a teaching tool for God’s people, according to Vos. The psalms teach us how to live appropriately in light of the future (eschatology). The psalms give us confidence, not fear; expectation, not ignorance; and a model for living godly in this age, not focusing too heavily on merely the present or the future. In short, the psalms balance and temper our view of eschatology. MRK: As someone who’s beheld both short-sighted worldliness and what Selvaggio calls “end-times silliness” in various churches, I can especially relate to the importance of the Psalter as a tempering tool. Vos’s fourth point is also particularly relevant to our discussions here on URC Psalmody: the Psalter powerfully attests to our fundamental unity with the nation of Israel, the church of the Old Testament. Whereas Biblical prophecy states this connection objectively, the psalms allow us to realize it subjectively. As Selvaggio summarizes it, “Because of the Psalter’s eschatological limberness, it transcends the limitations of the old covenant” (p. 153). JDO: Fifth is another point we often discuss: the Messianic element in the psalms. “The Psalter forces the saints of both [testaments] to recognize their mutual dependence on the redemptive work of the Messiah” (p. 154). MRK: Vos’s sixth point is kind of a “three-in-one” deal: he mentions the Psalter’s use of history as a basis for its view of the end-times, its central focus on God, and its emphasis on the coming kingdom. All three of these elements testify to the Psalter’s appropriateness for God’s people in every age. 1. Singing the psalms keeps our focus on the mighty acts of God. MRK: The subjective experience of our faith only has its proper place as a result (a derivative, Selvaggio calls it) of the objective truth of God’s work of salvation. And, consequently, “the Psalms remind us that our faith is about God, not about us” (p. 156). Advocates of traditional hymnody often complain about the frequent use of first-person pronouns (I, me, my) in looser hymns and contemporary Christian music. While this is often true, I’d like to clarify that this shouldn’t be our measuring line for a hymn’s quality. After all, Selvaggio admits that the Psalter itself is “rife” with references to the singer. We would do better to evaluate such songs in light of the overall themes of the psalms. Do the words focus on the mighty acts of God, or merely the subjective reaction of the singer? Are they sung for the glory of God or for self-encouragement? JDO: Yes. There’s nothing wrong with celebrating the things God has done for you personally, even within corporate worship. However, there is something wrong with doing it in a way that makes the song self-centered. 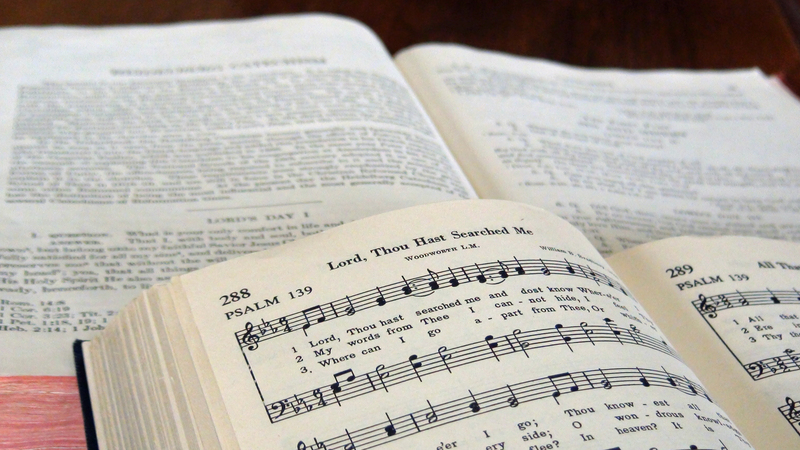 The psalms provide a model of songs perfectly balanced between subjectivity and objectivity. So we ought to sing the psalms, and also use them as a template by which to ensure that our hymns are properly God-focused even when personally specific. I will rejoice and be exceeding glad. 2. Singing the psalms saturates us with biblical eschatology. JDO: As we mentioned above, “the psalms serve as a helpful corrective to [a] skewed mentality regarding the role of eschatology in our lives.” Eschatology is all about looking ahead to the continuing work of God in this world. “The Psalms hold before our eyes the reality that God has intruded, and will intrude, into history in cataclysmic ways, ultimately yielding everlasting peace and rest for His people” (p. 157). Psalm-singing attunes us to these events in the past and excites us for the continuing works to come. MRK: It’s interesting to note that few hymns treat Christ’s second coming in much meaningful depth. Often they stop at the mere declaration that he is coming again—as if that were all we need to know. That’s not to say we can’t sing such hymns; but we should recognize that the psalms go dramatically further and deeper into the plans that God has made for those that love him. We need only read Psalm 16 or 17 to see that. JDO: Vos’s comments on the oft-referenced “new song” passages are also interesting. He writes that the “new songs” commanded to be sung in the psalms are new not in content but in context: our songs are in response to new acts of salvation. We sing the same psalms and hymns in fresh new ways in response to fresh new works that God is carrying out in our hearts. 3. Singing the psalms reminds us of the unity of God’s people and plan. MRK: I appreciated this point so much, I’ll just quote Selvaggio. “The Old Testament is not about a different God who made different promises. The Old Testament is also not about an entirely different church with entirely different salvific hopes and expectations. Simply put, the old covenant saints are not so different from us. Their hopes are our hopes. Their longings are our longings” (p. 158). Viewing the Bible from this perspective gives us a balanced and complete view of salvation history, and singing the Psalms enables us to realize that connection more fully. 4. Singing the psalms enables us to see the glory of Christ in new ways. Hence the Psalter has been at all times that part of Scripture to which believers have most readily turned and upon which they have chiefly depended for the nourishment of the inner religious life of the heart…[T]here is nothing in Holy Writ which in our most spiritual moments—when we feel ourselves nearest to God—so faithfully and naturally expresses what we think and feel in our hearts as these songs of the pious Israelites (p. 161). Next time: Chapter 10, “Psalm Singing and Pastoral Theology,” by Derek W. H. Thomas.